11th cent. - 19th cent. Part of Morocco. between Cape Bojador (Boujador) and Cape Blanc. with Sheikh Mohamed bin Beyruk (d. 1883). Río de Oro coast at future Villa Cisneros. 3 Nov 1884 Villa Cisneros (Dakhla) settlement founded. of Saharawi tribes in Río de Oro. and Cape Bojador (26° 8'N). Cape Bojador to Cape Blanc. 24 Feb 1895 Sultan of Morocco cedes Cape Juby to Spain. Africa Company post at Cape Juby to Morocco. the borders of Spanish Sahara with Mauritania. Fadil bin Mamin al-Qalqami "Ma´ al-`Aynayn"
(b. 1831 - d. 1910) at Smara in Saguia el Hamra. 3 Oct 1904 Saguia el Hamra annexed by Spain. 29 Nov 1920 Spain occupies La Agüera (Lagouira). and Daora in the interior of the Sahara. Territories of Ifni and Sahara). Sep 1936 Spanish Nationalist forces take control. 1938 Spain establishes El Aaiún (Laayoune). (Ifni, Río de Oro, Saguia el Hamra) established. 1 Jul 1957 Mauritania first officially claims Western Sahara. 12 Nov 1957 Morocco officially claims all Spanish West Africa. Nazaran and Ausert to 21 Feb 1958). of Spain (Saguia el Hamra and Rio de Oro). to Morocco by Spain in Treaty of Angra de Cintra. 14 Dec 1961 Spanish Sahara renamed Sahara. and Rio de Oro (Polisario) formed. 31 Oct 1975 Morocco occupies outposts evacuated by Spain. 6 Nov 1975 Morocco launches the "Green March" into Sahara. Spanish administration terminated by 28 Feb 1976. 17 Dec 1975 Mauritania occupies La Agüera (Lagouira). 26 Feb 1976 Spain terminates its administration. proclaimed by Polisario in interior regions. Boujdour, Laayoune and Es-Semara provinces). 14 Aug 1979 Former Mauritanian territory is annexed by Morocco. wall) between Smara and the Zini Mountains. 6 Sep 1991 - United Nations monitored cease-fire implemented. 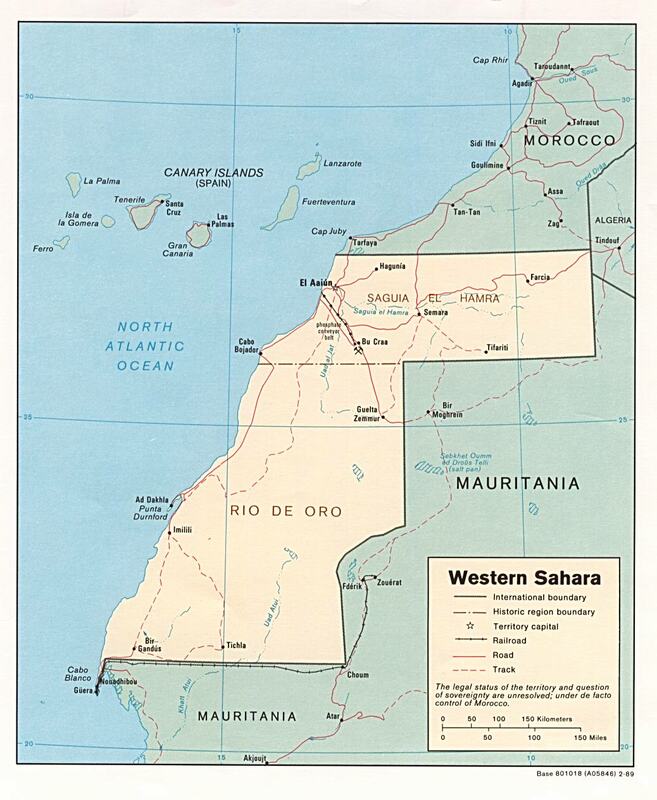 Territorial Disputes: Morocco claims and administers Western Sahara, whose sovereignty remains unresolved; UN-administered cease-fire has remained in effect since 6 Sep 1991, administered by the UN Mission for the Referendum in Western Sahara (MINURSO), but attempts to hold a referendum have failed and parties thus far have rejected all brokered proposals. Many neighboring states reject Moroccan administration of Western Sahara; several states have extended diplomatic relations to the "Sahrawi Arab Democratic Republic" represented by the Polisario Front in exile in Algeria, while others recognize Moroccan sovereignty over Western Sahara; most of the approximately 90,000 Sahrawi refugees have been sheltered in camps in Tindouf, Algeria since the 1980s.